Aslaug’s prophecy is fulfilled when she gives birth to a baby boy. Is the boy really a monster? Does Floki join forces with King Horic? Will Rollo forgive Siggy? Does Bjorn finally win the heart of Porfunn? Find out those answers and more on another great episode of Vikings. On this episode of The Vikings Podcast we’ll review and recap episode 8, Boneless. Then we’ll look at the history presented in the show and see how it compares to actual history. Princess Aslaug’s latest prophecy comes to fruition as she readies to give birth once more. 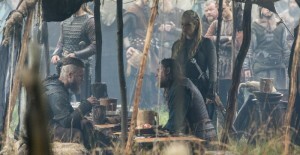 Ragnar, Horik and their new ally Lagertha set sail for Wessex–Ragnar and Horik have very different ideas about the true purpose of this trip.